You know that sinking feeling when you give your computer a command and nothing happens. Then, you try again a few moments later and it works just fine? Scientists at Virginia Tech say that kind of computer slow down is on the rise and it’s affecting everything from supercomputers to streaming video. Robbie Harris reports. 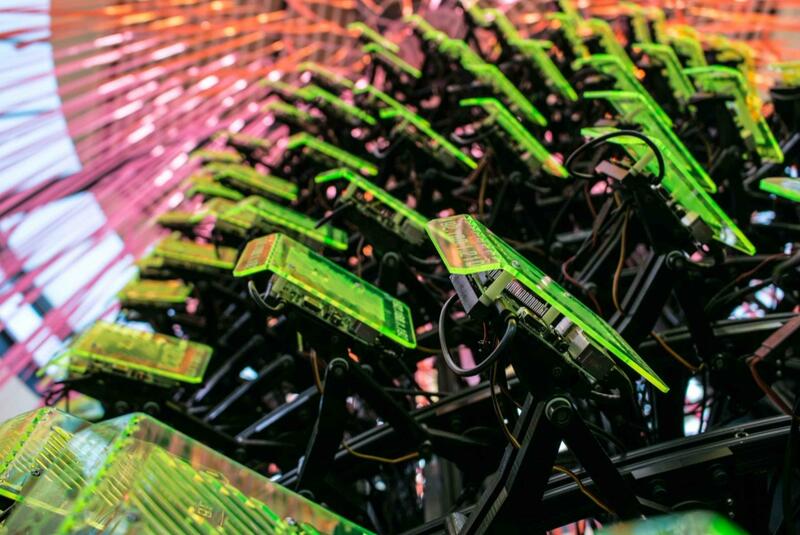 SeeMore, a 256-node parallel cluster computer and kinetic sculpture, was showcased at SIGGRAPH, the Association for Computing Machinery’s Special Interest Group on Computer GRAPHics and Interactive Techniques, 2014 in Vancouver, an annual conference on computer graphics. The installation was a collaborative effort between the visual arts and hard sciences. Kirk Cameron teaches computer science in Virginia Tech’s college of engineering. “And the more you use things like cloud and the more you bring lots of higher scale, larger numbers of systems together, that variability keeps going up. And that it makes it hard for scientists to determine how to help make the next generation of computers more efficient. They can’t figure out how efficient this generation is because the variability is so high. Here’s one of the obvious reasons for variability in our computers. “ For economies of scale we tend to take components and throw them together in a way to serve us. So when we build them, we tend to build them with components made by different manufacturers. Those introduce variance to in the systems. Cameron and his team of 4 other PhD’s from a variety of disciplines won a 3-million dollar, 5 year grant from the National Science Foundation to look for ways to deal with what is now becoming an exponential increase in this problem. Variability causes problems in large scale computing, e-commerce and the cloud and that makes life difficult for the Amazons, Facebooks and Twitters of the world, but when it comes to cyber security, variability may actually be a benefit. In fact, there may be ways to use the turbulence in the system to protect against attacks. The turbulence can become a convenient cloak for cyber attackers to hide behind, bobbing among the waves. It’s easier to spot an enemy vessel on smooth seas. So Cameron and his team are looking to for a way to harness the power of variability. And that’s a tool individual users could put to work as well. When it comes to things like streaming video, 9 pm on a Friday, you’re more likely to see that little spinning ball signifying it’s stalled. Cameron says that’s because, just like other distribution systems for things like, water, cell phone service, or electricity,\; they are all subject to failure where everyone is trying to use them at the same time. "5 Simple Ways to Improve Your Netflix Streaming"